Indeed boasts 100 million resumes and more than 200 million visitors every month. It’s free to post a job on Indeed. Alternatively, you can “sponsor,” or advertise, your Indeed job posting to get more views for only 25 cents to $1.50 per click. Following the right steps will prevent you from losing your account unexpectedly. At FitSmallBusiness, we use Indeed’s job posting options to find quality talent faster than with any other free or paid service. Our sponsored job postings show up at the top of the applicants’ search results, and we only pay when a job seeker clicks to learn more about the open job. If this is your first time posting a free job on Indeed, click now to get $50 in sponsored job credit. Here are the six steps to get the most out of your Indeed job posting. To post a job on Indeed, all you need to do is create a free employer account using your company email, fill in your pertinent job information, and then post it. 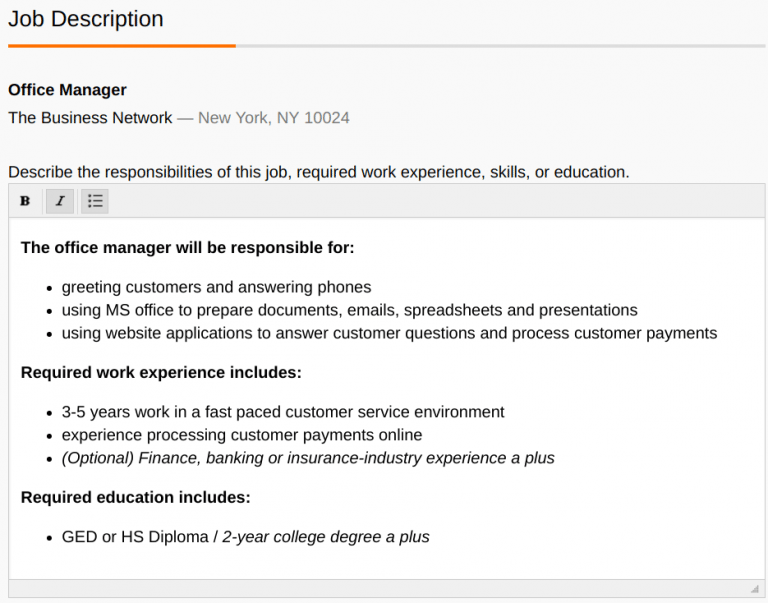 Indeed allows employers to post open job listings for free with no credit card required. It’s a great option if you’re making your first hires or cannot afford paid advertising. Choose the Employers option to post a free job on Indeed. When setting up your account, Indeed requires that you put some kind of text in the company name field when you post a job. You can use your business name or consider using a business unit name like “marketing department” if you want to post a blind ad. This comes in handy if, for example, you are posting a job for a new administrative assistant, and you don’t want your current admin to know. Screenshot showing how easy it is to input your first free Indeed job posting. If a free job post isn’t getting you the results you want, you can get more exposure with a sponsored job posting on Indeed. Sponsored job listings show up in the top two to three and the bottom two to three listings on each Indeed job search page. We’ll show you how to sponsor a job in Step 4. What’s nice is you can skip this step when you set up your job and sponsor the job later if you need more applicants. Half of all Indeed’s 200 million monthly job seekers hunt for jobs using a mobile device. That’s not a lot of screen real estate, so getting the most qualified candidates to click and apply on your free job posting will take some effort on your part. Here are a couple of ways to maximize your free Indeed job posting to ensure it attracts the most qualified candidates ― whether they’re searching from desktop or mobile. Some job titles get more action than others. You’ll need a descriptive but compelling title and may need to do a little research. If you need suggestions, read our article on how to choose a job title or use the job title generator on Indeed. Below is a screenshot of the job titles for accounting job roles and the number of clicks each job title gets. 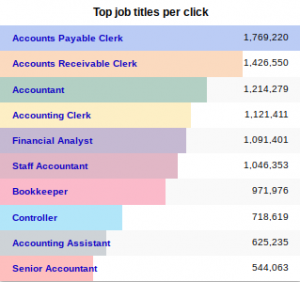 Notice how being more specific with the job title of Accounts Payable Clerk or Accounts Receivable Clerk results in significantly more clicks than the job title of Bookkeeper does? Comparison of similar job titles for accounting jobs on Indeed. These insights can help you create the best job title possible for your open job role so that it gets picked up by Indeed’s organic search and is seen by more qualified job seekers. Indeed’s Job Description field offers data fields to provide a description of the responsibilities, work experience, skills, and education. Having a good job description ensures that you’ll not only attract the right candidates but will also help unqualified applicants opt out once they see they are not qualified or that they don’t fit your culture. Indeed Job Description field with sample text. Here are some additional tips to ensure your job description attracts qualified applicants. 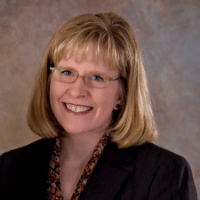 To reach more job seekers, make your job description easy to read, and be specific enough on the job description that job seekers can determine whether their skills match. Job seekers are probably looking at several jobs a day; you’ll want your job posting to stand out. Break the job description into sections with clearly defined headers like “Required Skills” or “Work Environment” and then use short summary or bulleted statements under each section as shown above. This helps job seekers scan the job description quickly and decide if it’s a job they can do and would like to apply for. Consider each requirement or desired qualification very carefully. When developing your online job posting, you need to think as much about who you want in your pool as how your posting might be discouraging good candidates from applying in the first place. 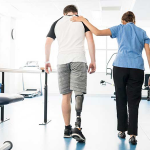 Every item on the job posting could be a source of encouragement or discouragement for the candidate to self-select into or out of your potential pool. While you want to make the requirements and the nice-to-haves clear, you also don’t want to have too long a list of “must haves” that could discourage great candidates from applying. Add a little information about your company and work culture, like when it was founded, or your mission statement, to help job applicants choose your company and your job over others. You’d be surprised how adding background information like how the company was started, that it’s a startup, or what kind of perks are offered can entice job seekers to apply. Indeed, like Glassdoor, posts company reviews from job applicants and employees. The page where reviews are shown is called your “Indeed Company and Careers Page.” Chances are that this page already exists, and you need to claim it. Go to Indeed’s website and type in your company name to find out. Ours is shown below as an example. 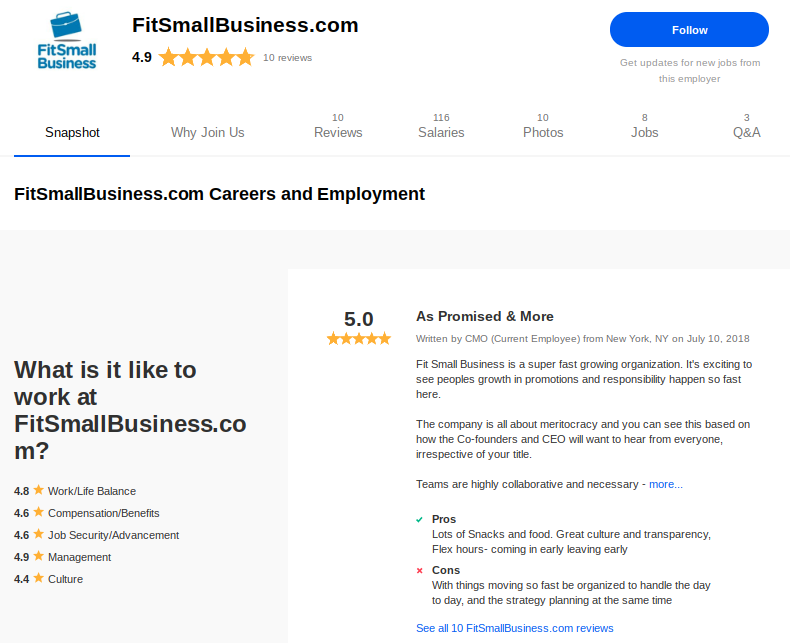 Example of our FitSmallBusiness Indeed company review page. This page lets job seekers learn more about your company and determine if it’s a good place to work. You can maximize your job postings by placing a link to it on your social media networks or embed it on your company website. It updates in real time, so if you pause or close a job in Indeed, it’s also removed from your Company and Careers page. For more information, read our article on how to claim your Company and Careers pages on Indeed. While there’s no limit to the number of free job postings, sponsoring your job ad can help you find applicants faster. 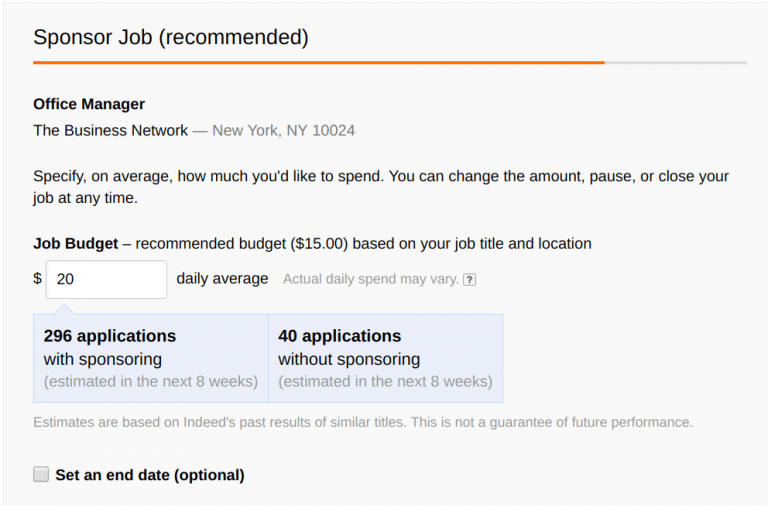 Sponsored job posts appear at the top of Indeed search results, and you can start with a budget as little as $5 a day. Indeed’s sponsored ads work on a pay-per-click cost model. You pay a certain fee for every job seeker who “clicks” on your job post, which generally costs between 25 cents and $1.50. The actual cost per click for your job posting varies based on competition for similar jobs in your area. Here’s an example of sponsored job postings showing up at the top of a job seeker’s list. See the jobs with red circled text. If you want to sponsor a post, click here to get $50 in free advertising. 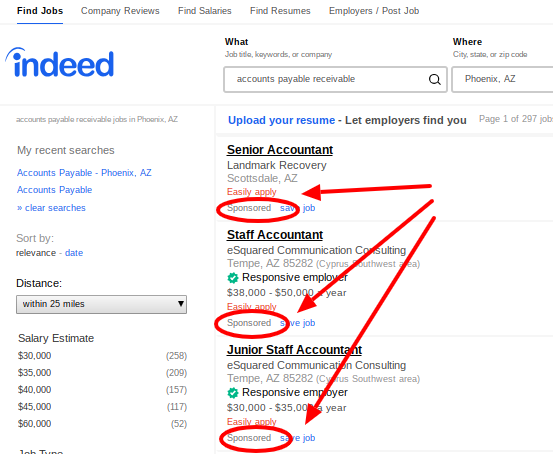 Sponsored results on Indeed show up ahead of free job postings. Don’t worry — your $50 sponsorship credit is stored in your account, so if you aren’t ready to use it now, that’s fine. In fact, you don’t need to decide at the time you set up the job. You can wait and see if your well-chosen job title and well-written job description attracts applicants on its own. If not, you can advertise your open job. If you want to do sponsored advertising for a job posting on Indeed, it’s as simple as shown in the screenshot below. At this step in the job posting process, you would click “continue” to set up your campaign and pay. Otherwise, skip ahead. Choosing your budget when sponsoring a job to get more visibility. You can set a monthly budget, a daily budget, and a targeted number of applicants. Indeed will try to meet your goals by bidding automatically for you. They’ll no longer display your job ad at the top of search results once your budget or your job posting end date is reached. However, job seekers can find your job post when they search for jobs with that job title. Indeed’s search results are based on relevancy and recency. Sponsored listings can outperform free job listings by three to five times. In fact, as free listings age, they fall further down in search results. Sponsored postings do not as they always remain visible, which results in more applicants. You can see this from our example in the image above, which estimates 296 applicants with sponsorship vs. 40 applicants with a free posting although, depending on the job opening, 40 applicants may be plenty. In addition, once you reach a certain threshold of sponsored ads, Indeed provides you the free option of being a Featured Employer, which means even more exposure by giving your company, your logo and your job ads more prominent placement on the employee’s job search page. Check out Indeed’s options to become a Featured Employer. Now, let’s focus on how to maximize your job ads on Indeed using your own website. Indeed is constantly on the search for job postings, using search engines and crawlers to find new ones to add to their site. If your business website is search-engine friendly, and you have a careers page with jobs listed, Indeed is likely to find and post those jobs for job seekers to find on Indeed — without you having to do or pay for anything. Below are suggestions to increase the odds that Indeed will find and link your job openings. Place the job title at or near the top of your listing, and make sure it is in bold so that it stands out in some way. If it is jumbled in with everything else, Indeed won’t link to it. Bold the title on your website’s job posting to help Indeed find it. Also, be as specific with your job title as possible, or consider changing it to a more popular job title which you can research on Indeed’s Job Title Generator. This seems like a no-brainer, but at times employers list only a contact email or application submission button and never include their company name because they figure it is obvious. However, Indeed needs this information to attach jobs to your Company and Careers page. Add your company name to all jobs posted on your careers page. In fact, Indeed is looking for listings with company names included, so take the extra minute to make sure you’ve added it in. If you have a company social media profile, add that as well. Indeed is looking for a physical location. Even if your business does not technically have one, put your business’s founding address, post office box, or the address where you get your business mail. Be sure to include only one location, as Indeed does not like multiple locations. Make sure to include a city, state, and ZIP code. If the job is remote or allows telework, that’s a huge plus. You’ll want to add words like “remote,” “work from home,” or “off-site” early on in your job description since Indeed won’t allow you to put this information in the location field. Indeed will not link to pages or job feeds that have more than one job on the page. It wants to see a custom URL for each job that is linked to a specific job posting. So, if you have multiple job postings on your website, create separate web pages for each. Each job posting on your careers page needs a unique URL. If you’re using applicant tracking software like Freshteam, it will typically provide a URL link for each job. Include lots of keywords related to the role and industry in your job description. It’s also a good idea to repeat words from your job title whenever you can. The more keywords that are repeated, the more likely it is that search engines and Indeed will find your job posting. While there’s no limit to the number of free job postings, sponsoring your free indeed job posting can help you find better applicants faster. You can sponsor either a posting that is on your website or one that you have posted directly on Indeed. Make sure you close any open jobs posts before you post another job with the same job title, or Indeed will flag you for posting duplicate positions — and may lock your free account. Go to the job and choose close. For example, let’s say you open a job for a waitperson and then fill it with a great hire; then next week you have a new opening. If it’s a sponsored post, you may be able to leave the same job open and use that one job posting to attract and fill as many of the same job role as possible. However, if it’s a free job posting, it’s better to close the filled job and repost a new job so that it’s fresh. Below are common questions with answers that can save you time and mistakes when using the Indeed job board, especially if you’re posting jobs for free on Indeed. If you have questions that aren’t addressed below, post them on our forum for a quick reply from one of our business experts. Why Can’t I Repost a Job Instead of Sponsoring? You may be wondering if you can repost free open job ads to get to the top of the search results, instead of sponsoring your job posts. The answer is no. In fact, you’re likely to get your account locked if found posting duplicate jobs to get them to show up in Indeed’s search results. 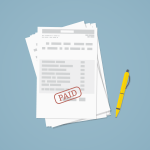 Once your account is flagged, you may be required to pay for all job postings going forward. If you’ve tried all the options above, and your job postings aren’t getting the desired results, we recommend you sponsor the job post to increase your reach. What Are the Benefits of Posting a Job on Indeed vs. Another Job Board, via Social Media, or in the Local Newspaper? If you aren’t convinced about posting a job on Indeed, here are three reasons to consider it. Maybe you aren’t getting enough applicants to your job posting or want more control over finding good candidates. Indeed allows you to source your own candidates that match your job description. This may be more affordable than contacting them using social media tools like LinkedIn InMail or LinkedIn Recruiter. To learn more, read how to search resumes on Indeed. This may seem simple but, for even the most complex roles, Indeed always delivers at least a few applicants. In fact, 65% of all jobs are filled through Indeed (see chart below). Since the process to post a job on Indeed takes about only about two to three minutes if you already have a job description ready, it’s worth your time. 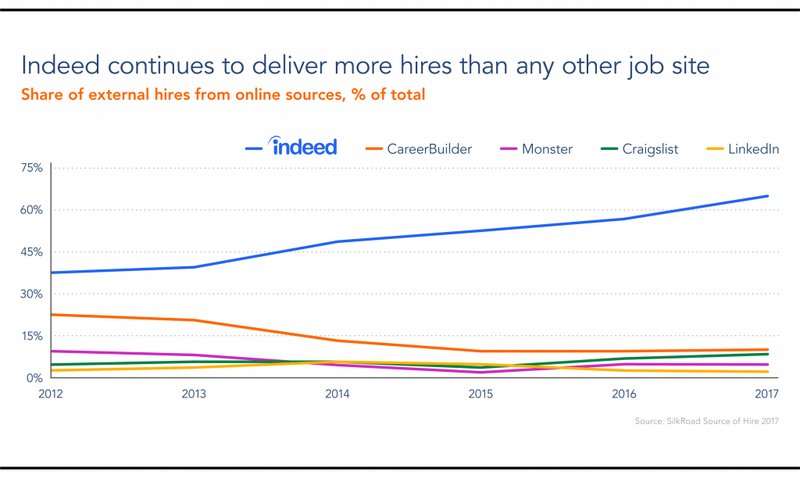 Indeed delivers more hires than other job sites. Based on our own experience at FitSmallBusiness, compared to other job boards, the applicant quality on Indeed, in general, is better. Indeed gives you nice flexibility when hiring. For instance, even if you’re not logged in, you can view applicant resumes via email alerts. Indeed attaches the full resume of an applicant to the email alert you receive. 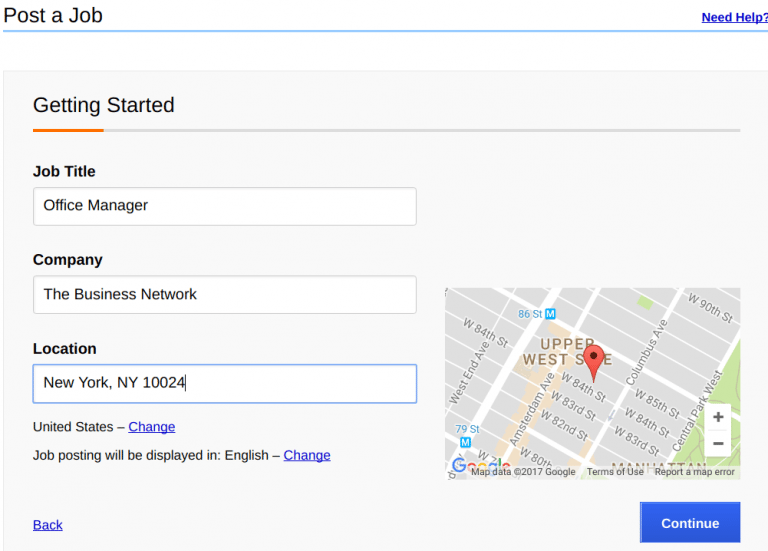 You can also log into Indeed and go through and organize candidates systematically. It’s like having your own applicant tracking system as you can see below. ATS features on Indeed, such as job candidates (names hidden for confidentiality). Is There a Limit to the Number of Free Job Ads I Can Post? There’s no limit to the number of free job postings you can list on Indeed’s job board. However, sponsoring your most critical jobs can help you find better applicants faster. If you do a sponsored posting on Indeed, you can terminate advertising as soon as you feel you have enough qualified candidates or by closing the job opening — you’ll still have access to any candidates who applied. Do Other Software Post Jobs on Indeed? Whether you’re using another job board, recruitment software, or using our top recommended time and attendance software, Homebase, you’ll find Indeed often picks up and cross-posts those job ads as well. In fact, we recommend Homebase to small businesses seeking free job ads for hourly staff in addition to free drag and drop timekeeping software because it includes a free mobile app, robust manager/employee communication, and even provides free job posting features like job description templates you can start with. Can I Delete a Job Posted on Indeed? Indeed makes it very difficult to delete a job on Indeed and for good reason. What you need to do instead is close the job, which updates the status of the job so that it no longer shows up for job seekers. That way, you’ll retain access to any applications and be able to copy that job’s details when you have another similar role open. If you truly need a job deleted from the system, as in removed forever — applications and all — you’ll need to send a support request to Indeed. Indeed can be a great tool for finding quality employees, especially if you put some effort into making sure your job posting is accurate and compelling. Following the steps and tips above, you should be well on your way to getting a good set of quality applicants and making the most of your Indeed job posting, whether you post for free, or sponsor your job posting to get more candidates. Click to get $50 in free sponsorship credit on Indeed. Thank you for your insightful article. I have sought to find how to delete postings on their website and have been unable to determine how this is done. I posed this question in their information section and did not get a response. Can you tell me the process how this is done? We have been threatened with having our account locked for duplicate postings and want to avoid that if possible. It appears a lot of Indeed users have this question. The trick is not to delete the job posting, but to CLOSE it. (As if it were filled). That way you won’t have two open postings of the same job. The reason Indeed doesn’t have a delete option is that they don’t want you to lose any applicant history with an open job. Once you CLOSE a job, you can still go back and look at it, copy it and so forth. To close a job, click on the job itself within Indeed and choose the close button. If you truly want to DELETE a job, you may have to send them a support request. Gee, I wish I had found this before I posted with them. We had ads running for free with amazing results except for one job. We talked with the account rep assigned to us and she talked us into a $350 ad. We got NOTHING. Luckily we finally filled that on our own. After about three months we had all of our ads frozen. We were told that the Squall Team flagged us for reporting. I told my rep I we had emails inviting us to repost and sent her a copy. She tried to sell us on a $1500 a month account. From zero to $1000 minimum. I told her we will do $50 when we need something. Our $50 ads are getting nothing, no where NEAR what we got with the free ones. I want to try getting the attention of our ads and get them picked up from our website. Do you know if they will being we are “red flagged” and recognized by the Squall team? Will it still pick them up? I’ve had good luck posting jobs for free on Indeed. Of course, once you purchase a package, like all vendors, they’re going to offer to up sell to their full service offerings. Your best bet is to call your Indeed rep to ask your question. If you’re not satisfied with that rep, ask for another. If all else fails, set up a new free account with a different email until you can sort things out. A lot of factors affect your ad success, including your job description, location, pay rate, and key words. Sometimes it’s worth paying an HR consultant to do the recruiting leg work for you. Check out our entire HR section full of ‘how to‘ articles or try other free job search sites. An interviewer told me yesterday that she had a difficult time reading the resume I posted on Indeed dot com. I gave her a hand typed one in person when I met with her. I thought you should be made aware of the sight. Thanks for sharing the information. Most job search sites and ATS systems prefer resumes in plain text, little to no formatting, no tables — that’s because their resume screening software has a difficult time ‘reading’ extraneous formatting. Best of luck to you in job hunting. Hi I have a cleaning business that I would like to advertise on indeed ,can that be possible?? If you’re looking to hire workers, yes, you can advertise the job opening on Indeed, but if you’re looking to advertise for clients to use your services, you might consider using Facebook or another advertising vehicle instead. Indeed isn’t appropriate to advertise your business. Although you may consider using a freelance site to offer your services as a freelance ‘home service worker’. Here are articles that may help.